Discover this residential renovation project for the living room, dining room and kitchen of this Greenfield Park home. 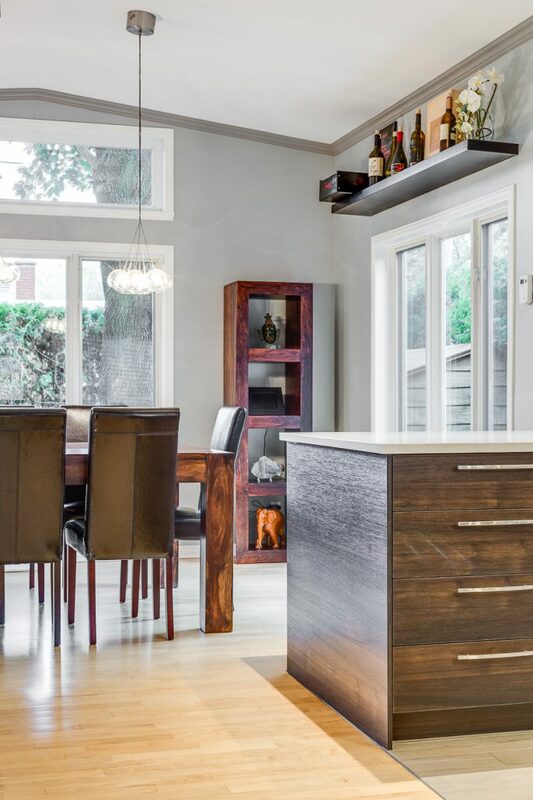 Take advantage of our expertise as a general contractor specializing in residential renovation, in addition to our turnkey renovation services. Call us for a free consultation! Our work leads us to work on projects that are more different from each other and this Greenfield Park house is a good example. Our customers have been dreaming of change for some time. They wanted to redo much of the ground floor of their house, including the living room, dining room and kitchen. We have assembled our team of designers and architectural technicians to make our clients’ vision a reality and support them throughout their project. The first phase of the project consisted mainly of the demolition of part of the ground floor. During this phase, we removed the linoleum floor, knocked down a small wall and removed the cabinets and counters in the kitchen. Our team also partially remade the electrical system to accommodate the new lighting and the installation of a stove in the centre of the kitchen. Then, we installed a new hardwood floor for the living room and dining room, and a ceramic floor for the kitchen. Then, we added wooden planks on the false ceiling of the kitchen and added suspended lamps and ceiling lights. We have opted for neutral tones for the three rooms, thus giving us the possibility to complete the decoration with brighter colours, for a beautiful contrast effect. For the kitchen, the customers chose to have an island in the centre. 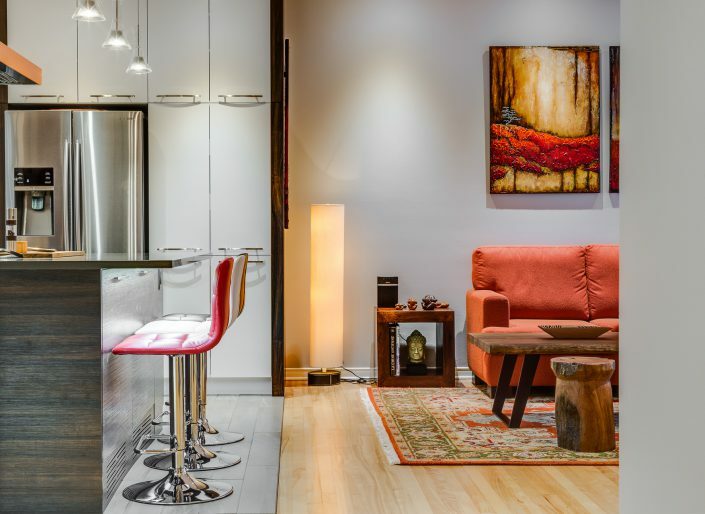 The kitchen island was custom built to accommodate an electric stove with integrated oven and a dining area for three people. We opted for a granite covering. We have added custom white melamine kitchen cabinets for maximum storage. Our kitchen designer advised customers to add stainless steel appliances (two-door refrigerator with built-in freezer and dishwasher) to complete their decor. The kitchen also includes a new countertop with ceramic covering that goes all the way to the refrigerator. This multifunctional counter holds drawers and even a cellar. For the dining room, the customer wanted to stick to noble materials such as wood. Therefore, we recommended a wooden furniture, as well as a wooden shelf and a wooden shelf, for a more classic look. We opted for suspended lamps above the table for a softer lighting effect. 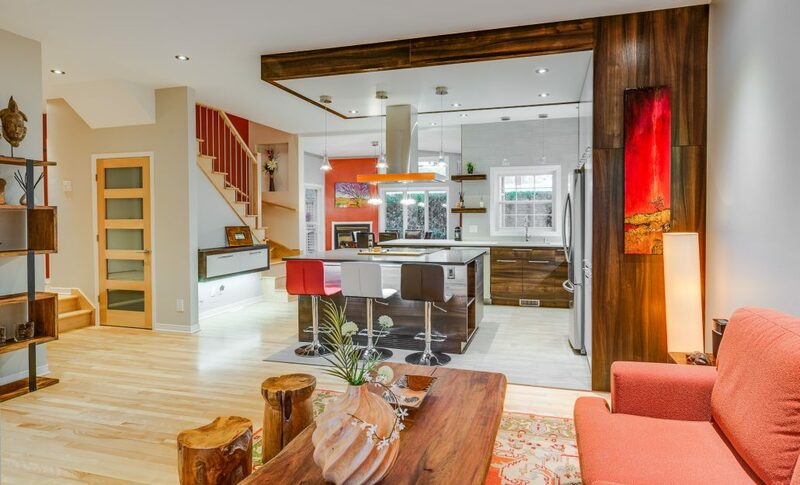 As a general contractor specializing in residential renovation, a project of this size requires us to take charge of all stages in order for this project to be successful. To do this, we have established business partnerships with electricians, plumbers, cabinet and counter manufacturers and even lighting experts to ensure that each customer is completely satisfied with the final result. 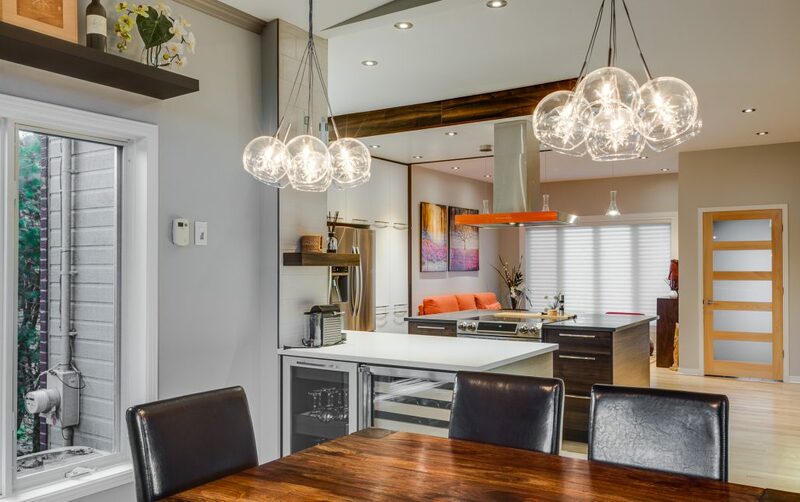 If you would like to know more about this residential renovation project of the living room, dining room and kitchen in Greenfield Park, our turnkey renovation services, our prices, or our other services, we invite you to contact us by email or phone. Your first consultation is free of charge! Our team will be happy to welcome you and answer your questions.